Flora’s War is a rich book. Rich not only for its beautifully written and compelling story, but rich also for the way it transports you in time with its illustrative style. Pamela Rushby has written an amazing tale steeped with history, coming-of-age, friendship, love and a taste of what it was like to be female during World War 1. 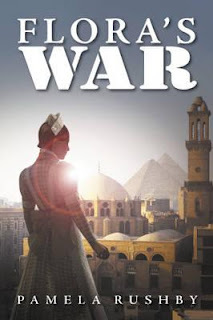 Flora’s War is set in Cairo, Egypt in 1915. Flora, a sixteen-year-old Australian is visiting Cairo with her archaeologist father, both regular visitors to Egypt during excavation season. This time around, Flora can already sense that this year’s trip won’t be like any other. She sees the army bases set up, the soldiers roaming around, the influx of nurses sent over for duty and how fewer excavation sites there are in Egypt. Still, Flora goes about her typical life in Egypt – staying in an extravagant hotel, ushered around by an influential Egyptian, working on her father’s site and traipsing around Cairo with her best friend, Gwen, an American girl whose father is also an archaeologist. But within moments, their usual life changes to something extraordinary. Flora’s lush hotel is overtaken by the army and converted to a hospital, forcing her and her father to move to another house, known as the house of the butcher and blacksmith. And things keep changing, soon Flora and Gwen are given first aid training at Lady Bellamy’s Recreation and Rest Centre where they volunteer their time writing letters, talking and serving tea to the soldiers. Quickly, their volunteering duties start to involve driving the wounded soldiers to and from the hospital, as they start to arrive by train from Gallipoli. Flora and Gwen see unspeakable travesties that will change their life forever but in these tragedies, they find solidarity in friendship, love and being a modern woman. Flora’s War has many, many strengths. The writing is poetic and transformative – so vivid and articulate that it is so easy for the reader to lose themselves in the bedlem and magic of dusty Cairo, or the heart break of the mental ward set up in the makeshift hospital that was once an extravagant hotel. But more than that, it is easy to get lost in the characters – so wonderfully carved, full of life and character, and wholeheartedly believable. Flora paints the picture perfectly of what it would have been like to be a female growing up in this time – fighting to be a modern woman with simple tasks like learning to drive a car or working on an excavation site. With so much subtext and so many sub-stories, Flora’s War, is an epic story that will engross anyone who picks it up. Both Jackie and Pamela write terrific historical fiction - can't get enough of them. I'm eagerly waiting for my copy of Flora's War to arrive in the post.